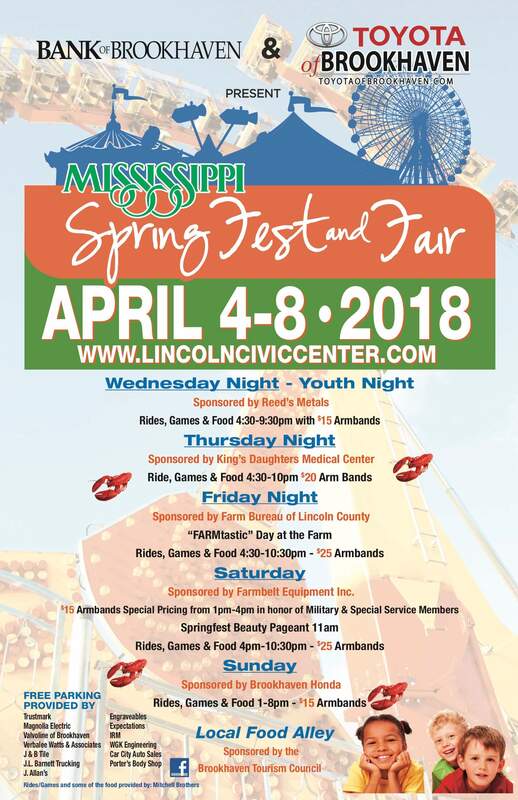 The Spring Fest and Fair is right around the corner! Join us April 4th – 8th at the Lincoln County Civic Center for some Spring filled fun. This exciting event will include a variety of rides, games and delicious fair food! There will be typical fair food and rides each day/night of the event. The Local Food Alley will have amazing food from local restaurants. It doesn’t cost anything to get in the actual fair, and parking is free, so you can walk around taking in all the sights, smells and sounds of the fair for free! Wednesday from 4:30-9:30pm is youth night and armbands are $15 each. Thursday from 4:30-10:00pm armbands are $20. FARMtastic day at the farm will be held Friday night from 4:30- 10:30pm and armbands will be on sale for $25. The Springfest Beauty Pageant will be held Saturday at 11am and rides, games and food will be available from 4:00- 10:30pm for $25. The last day of the fair will be Sunday from 1:00-8:00pm with $15 armbands. This is a great time to come out with your family and friends to visit and see what an experience Brookhaven can be. We hope to see you there!